A new-look First Class Lounge at Leeds station – with almost quadruple its previous capacity - is now open for business as Virgin Trains continues to give its east coast route a makeover. Ribbon-cutting duties were performed by Sir Gary Verity, Chief Executive of Welcome to Yorkshire and Tom Riordan, Chief Executive of Leeds City Council at a launch party on Wednesday 6 April. In the first year since Virgin Trains took over services on the east coast route, First Class travel has grown by six per cent. Eight lounges between London and Edinburgh have been given the Virgin treatment, tripling the seating capacity across the route and providing more options to hold meetings, work and unwind in a stylish environment. A splash of red has been introduced into the innovative lounge designs, which include new meeting points, desks for customers to work at and relaxation spots to chill. Free wifi and powerpoints have been provided throughout, along with soft drinks, snacks and newspapers. Leeds’ new lounge can comfortably host43 customers – almost four times the previous capacity of 11 customers – and the investment will help Virgin Trains drive further growth in First Class travel among business people who can prepare for meetings onboard and leisure passengers treating themselves to a luxury journey. The latest improvements come after Virgin Trains embarked on a £21m refurbishment of its trains, including putting leather seat covers in First Class. Leeds is the sixth lounge to open following a Virgin-style makeover. 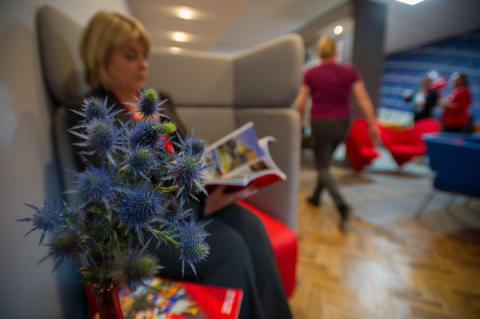 In the last week, lounges have opened in Newcastle, Wakefield, Doncaster, Darlington and Edinburgh, with London King’s Cross and Berwick to follow in the next few weeks. “Our brilliant new look lounge at Leeds Station is just part of our £40m investment in trains and stations across our east coast route that will help us lift the experience for all our customers. “I am really encouraged to see this investment first-hand and to hear it’s only part of a raft of improvements for all passengers on this route.As train journeys for both business and leisure use continue to grow it’s so important the service matches this increase in demand". On the East Coast route, £140m is being invested to create a more personalised travel experience. This includes a major fleet revamp, smarter stations and exciting new routes. From May 2016, there will be 42 additional services (22,000 extra seats) per week between Edinburgh and London. 2018 will see the introduction of completely new Azuma trains being built in the UK by Hitachi. Visit the Virgin Trains Media Room - www.virgintrains.co.uk/mediaroom - for the latest news, images and videos. 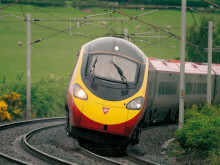 Subscribe here for regular news from Virgin Trains.